A picture that I took on my last day! I can't believe that Courtnnie is married and has a baby on the way. When I first heard about Court moving to Alaska I thought no way in hell will she get passed Mississippi without screaming for warm weather. God bless that woman she proved me wrong and is living the life with her fantastic husband in Alaska. I would say that I'm jealous, but if anyone deserves this amazing life changing event its Courtnnie. I'm so thankful that she found such an amazing man who serves our county in the Coast Guard and who serves her at home. What more could a woman ask for really? I decided that while they are on their 3 year track in Alaska with a baby on the way, this would be a perfect time to go visit. Luckily for me it gave me a free place to stay and a travel companion since I wasn't bringing anyone with me. Plus I think Courtnnie seemed to enjoy showing me how rugged she was while dealing with the Alaskan weather and shopping. Both are treacherous. I swear if it weren't for Walmart and McDonalds you could just about assume that you were on another planet. It was definitely my kind of place! I absolutely loved the way life was up there. It was slow moving, calm, beautiful and friendly. Here's a quick little story to explain how laid back people are up here. To get to Kodiak you have to fly into Anchorage and then take a "puddle jumper" to Kodiak. When I arrived in Anchorage they told me that none of the flights from Kodiak have come in or gone out because of the weather. Being that my flight was the last one for the evening they pretty much told me that I don't have a shot in hell on getting on the flight. Since I didn't have anywhere else to go I ended up waiting until it was time for the flight to leave anyway to see if anything had changed. Twenty minutes past the time our flight was supposed to leave a girl makes the following announcement. "Visibility in Kodiak is around 2.5 miles and the regulations require 3 miles, but since its getting late and well we want to go home, we're gonna give it a go!" I'm sorry, you're gonna WHAT?! I looked around at the other people that looked like natives and asked if they were serious. Apparently they were since everyone started to line up. Now here in the states (yes I know Alaska is a state, but if they don't believe it why should I) we wouldn't normally hear anyone say "we're gonna give it a go" when it has to do with FLYING! This is when I knew I wasn't in Kansas anymore... or anywhere else in the states. Needless to say, I made it in to the small little town of Kodiak with a super cute Courtnnie to greet me. She brought me home to her house and we waited until morning to explore the area. Of course the first thing I wanted to do was eat some real Alaskan food. We ate at a place called Henry's and the only thing I can say about the food was it was EXPENSIVE. 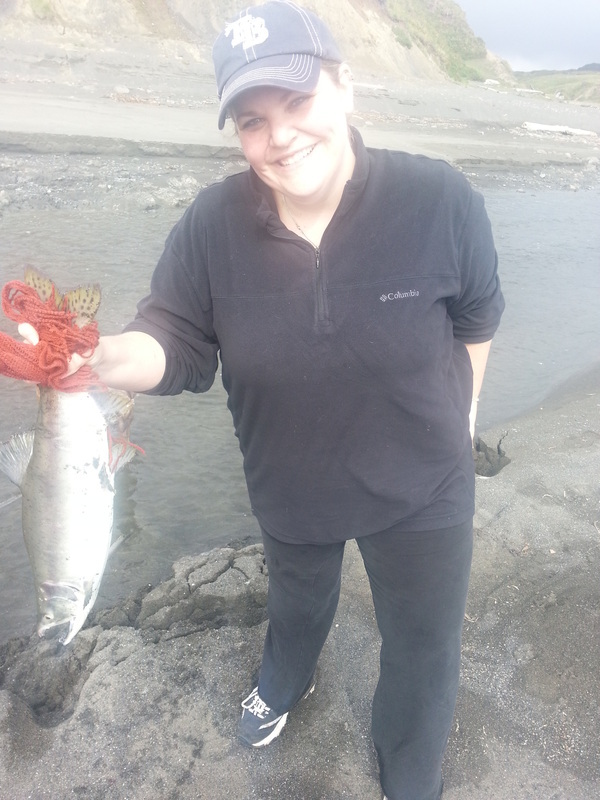 You really don't hear much about Alaskan food unless you kill it or catch it yourself. I was lucky enough to taste a recent catch of Pink Salmon and Halibut that her husband Nate had caught just a few days prior. It was delicious! While we were out in town we were told by some lady at one of the local tourist shops that we could walk a nature path and see Puffins. If you don't know what a Puffin is it looks like a cross between a Tucan and a Penguin. While Courtnnie and I went down some pretty sketchy looking paths we decided that maybe it wasn't such a good idea to walk alone without her dog or a gun considering Alaska is known for their bears. Just a few more steps on the path and sure enough we see a bear track. We decided that Puffins could wait for another day. The weather in August in Alaska was beautiful. I ended up bringing clothes that were a little too warm for the weather that we had. It was like November in Florida minus the palm trees and snow birds. We went on a lot more Courtnnie and Jenni adventures which I miss dearly. 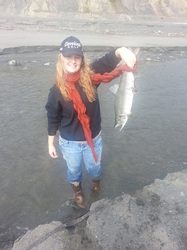 One of the trips we made was too the beach where all of the pink salmon were headed upstream. Both Courtnnie and I caught a "pink" with our bare hands. 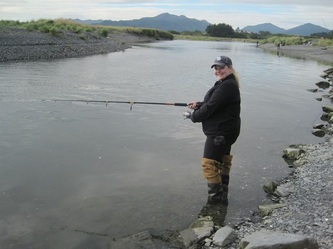 We couldn't eat them because they were practically dead after the exhausting swim they had, but it was still awesome to say that "I caught an Alaskan Salmon with my bare hands". How many people can say that? I can't remember a time when I felt this close to god or nature. It made me feel alive after being dead in my life for so long. So much has happened in the last couple of years and this was the first time I felt life deep in my bones. Maybe it was the weather, maybe it was all the beautiful views or maybe it was because Courtnnie and I had a chance to reminisce. Either way, I enjoyed every minute of my trip. From the moment I got on the plane I started enjoying myself and my life. I've been a mover and a shaker for as long as I can remember, but visiting this state made me want to just sit back and enjoy mother earth. While I love living in a state that has sunshine, warm weather and palm trees year round it was a blessing to get out and see such an amazing part of our country. This was absolutely a life changing trip! It made me want to pick up and move to Alaska or at least to some place where cell phones, internet and cable aren't relied upon as much. I must say Thank You to Courtnnie and Nate for allowing me to stay in their home and show me around this beautiful area. It was so incredible it makes me want to see it again and again. Don't forget to check out the rest of the pictures! _When I first won this trip on my birthday I was SO excited! American Airlines was giving away a trip a day for 25 days and I just happened to win one. It was a $1500.00 voucher to be used on any vacation package that AA offered. In August I planned on going on this trip with my boyfriend. He and I had been seeing each other for a few months and we were excited to plan out this trip together. Unfortunately our plans got ahead of us and we didn’t make it. We broke up in October which made me frantic to find someone else who could go. Out of all my friends who could afford a plane ticket, take time off before Thanksgiving, share a room with me and endure the excursions that were already bought and paid for. My sister Patti came through! She had to rush and get her passport updated before she could buy her flight out there, but it was a sigh of relief when the mailman came through with it. She purchased her ticket and we were on our way. _When we arrived in Montego Bay Jamaica we stayed at the Holiday Inn Sunspree. I’m not going to go into too much detail here, but unless you have a caravan full of kids I would stay away from this place. We made the best of our trip and ended up talking a lot in our hotel room about our past, present and future. It’s funny how close our family is and yet how much we miss when we live so far apart. Realizing early on that we didn’t like the food it didn’t take me long to find out that the gift shop held an indulgence we couldn’t resist. We liked to call them “meat pockets”, but the locals call them Juici Patties. OMAG! (Oh my amazing goodness) these things were meat filled pastries that were similar to empanadas. OMAG!! _The next day we went ATVing. This is something my sister and I used to do in Catskills, NY where my family used to have a vacation home. We would go up every summer and go fishing and ATVing so it was like reminiscing to get behind the bars of these 4 wheel units again. We trucked up the mountain and down into a little village where the kids came out to wave. They were so excited to see these ATVs driving through their town. As we went up the mountain you were able to see so many beautiful views of the ocean and other magnificent mountains. Our guide even took us off the beaten path and talked about their national dish which included the fruit called Ackee. Later my sister and I tasted the fruit in our dinner. He also told us about Guava which sounds like a super food that even Oprah would be proud of. Plus a tree called the Soursop tree which the guide told us it would help someone with Parkinson’s disease. Later I looked it up and it seems he may have been wrong. Gotta love the powers of the internet. _On our last full day on the island my sister convinced me to try a massage and reflexology at the spa in the hotel. I had never had one before and I was a little afraid of someone touching all over my back and feet. I ended up really enjoying the massage, but not completely loving the reflexology. It seems as though the reflexology would have been better for someone who doesn’t have ticklish feet. The massage on the other hand was incredible. It soothed my whole body and made me feel completely relaxed. Our last night in Jamaica and we decided to try out the Italian restaurant at the hotel. It had a great ambiance and the food was fresh and filled with flavor. We found that in Jamaica most of the food was pre-made or fried, but at this restaurant everything tasted so good. It was a great way to end such an amazing trip. It was even more awesome to spend some quality time with my sister and to share our love for life! 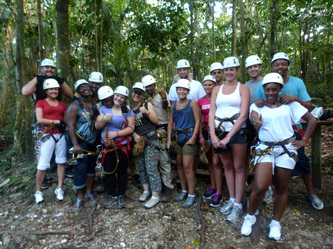 _Zip lining was an experience that I will never forget. I’m so addicted to the feeling of flying through the air that immediately after returning from Jamaica I started looking up zip lining in Florida. Imagine a beautiful 80 degree day with a light wind and a tropical forest just waiting to be explored. Everyone is ready to see what awaits them in this beautiful hillside. 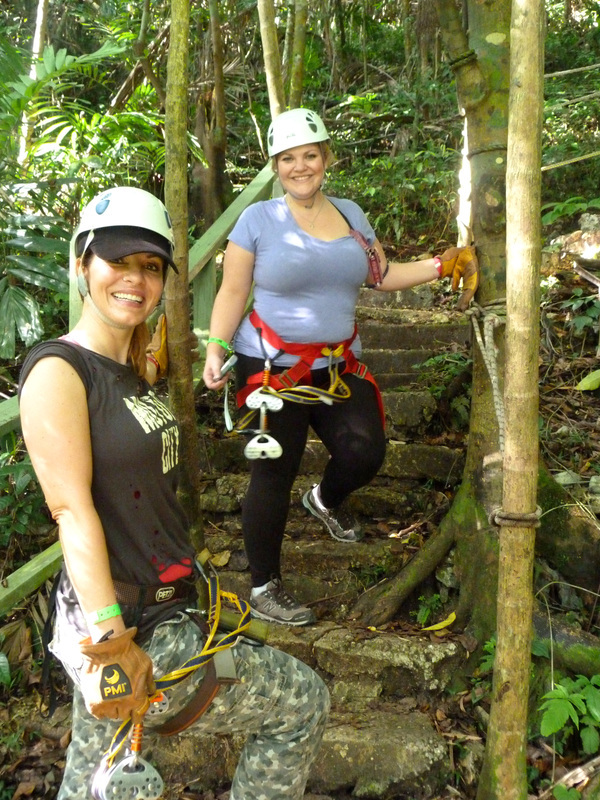 Walking up to the first zip line I looked at my sister (Patti Reilly) and said “I’m not so sure I can do this”. Patti was a little worried that I wouldn’t make the jump, but after watching her take the leap first and trusting her laughter along the way my fears just dissipated. I couldn’t wait to have the tour guide tell me it was my turn to take that leap. As Rico set me up on the ropes and told me to grab on all I could do was think about letting go of every fear I had and just enjoy the ride that was awaiting me. Making that jump (yes, you have to JUMP) and seeing the land and beautiful river below was incredible. There were lush green palm trees, bamboo, and a rocky river that reminded me of one that we lived by when we were kids. At the end of the ride my sister was at the other end with a huge smile. It was just what I needed to get through my first line. After that I couldn’t wait to get to the next one. We had a couple people in our group that were holding things up a bit, but it’s an incredible experience to witness other people conquer their fears. We watched a woman who was so scared before, during and after each jump. At one point our guide had to get on the line with here because she was about 10 feet away from the end of the zip line. He hooked himself onto the same line as her and wrapped his legs around her waist then he pulled both of them in like a spider monkey on the line. 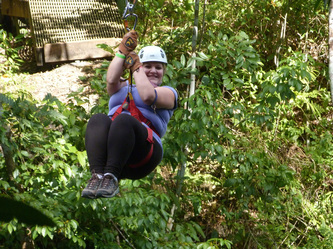 She ended up being extremely scared after that and she didn’t want to go on, but when you’re zip lining in a mountain like this there is only one way down. By the end she finally did the longest zip line in Jamaica without a scream or whisper. Everyone in the group cheered and clapped for her success! 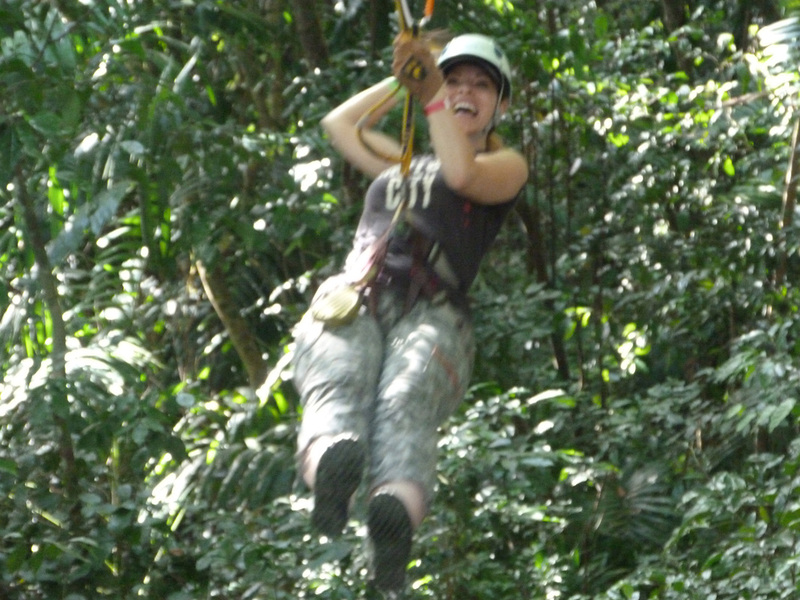 I would love to do this amazing adventure again and again. I never would have thought that I’d enjoy soaring across a cliff with just a few ropes and nothing underneath me but rocks and a shallow river. The whole experience was amplified by the amazing crew that led this journey, Rico and John the best guides ever!